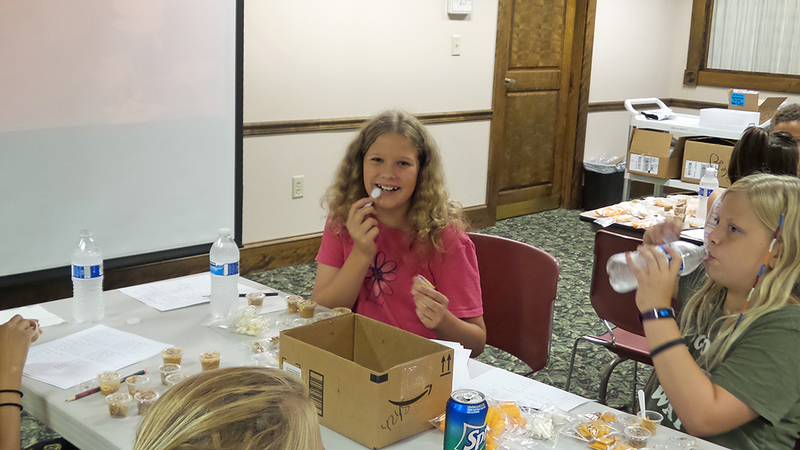 Kate Bowen, 11, samples peanut butter at the Sweet and Salty Taste Test at Hussey-Mayfield Memorial Library. A group of kids and teens got the chance to find out the answers to questions such as, “Does the name brand really taste better than the store brand?” and “What does peanut butter made out of peas taste like?” during the June 20 Sweet and Salty Taste Test at Hussey-Mayfield Memorial Public Library. The blind taste test gave young people the opportunity to try different flavors, textures, appearances and smells of various snack foods. Each youth sampled several small packages filled with different brands of peanut butter, cheese crackers, cheese puffs, cinnamon cereal and popcorn. The samples were numbered so participants could write their observations, such as appearance and flavor, but they did not know any other details about the products. At the end of the event, the brands were revealed, adding an element of surprise when the group realized not all of the food was what it appeared to be. The event was offered as part of the library’s Rockin’ Summer Reading program, which rewards participants of all ages for reading. Teens and young adults in grade 6 through age 20 may also earn bonus prize drawing tickets when they attend library events. Summer Reading continues through July 28 and is open to all Zionsville residents. For more, visit zionsvillelibrary.org/summer-reading/.